...Yes, Rosas, a fantastic bay, with fascinating rocky islands, Illes Medes at the south and Rosas at the north with two large apartment towns with miles of canals penetrating, full of decaying and sunken boats and with just a few really nice bits where people have invested time to make their homes pleasant, in the middle. Me with head stuck in diesel fumed engine compartment sorting out leaking filter. French single hander sleeping days next door awaiting pension payments. 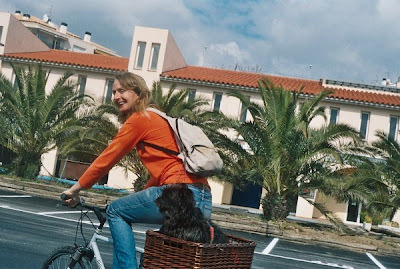 The bike is a boon, with Loba happily travelling in the basket, I can scout out the diesel filter stores and cynically visit the above apartment complexes and feel grateful to not be living with sunken boats at the end of the garden.